The IBPS Clerk Preliminary Examination has started and the SLOT 1 of IBPS Clerk Prelims Exam 2017 was in the easier range. The Quantitative Aptitude and Reasoning Ability section was easier and the English section was in the moderate range. 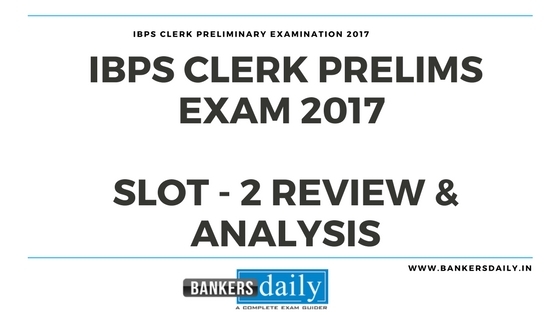 So if you are attending the IBPS Clerks Preliminary Examination 2017 in the forthcoming batches, please check the review of IBPS Clerk Prelims Exam 2017 SLOT 1/SHIFT 1 from the following link. The Slot 2 review of IBPS Clerk Prelims Exam 2017 is here. Not much changes when compared to the 1st slot of IBPS Clerk Prelims Exam 2017. The exam was easier and please if you are having exams in the forthcoming batches, please try to attend maximum number of questions. Only English section was in the moderate range and all the other sections(Quants and reasoning were easier). Puzzles and seating arrangement questions were easier and anyone can solve those problems and it is of basic level. So attend maximum number of questions in the forthcoming batches. How many questions have you attended in the IBPS Clerk Prelims Exam 2017 ? Alternately you can comment the questions asked in each slots as comments under the same post which will be useful for the candidates who are attending the IBPS Clerk Prelims Exam 2017 in the forthcoming days and in the forthcoming batches. The Miscellaneous questions were asked from Profit & Loss, Simple Interest, Time & Work and Discounts. A circular arrangement was asked and it is based on persons sitting facing inside the circle. A Puzzle based on months was asked involving 8 persons. Alphabet series and Number series was asked which formed the most questions other than the seating and puzzles. Order Ranking was asked in this slot. The Error Spotting question was difficult and it was to find the sentence that is without any errors. So please check the information before the questions carefully. Reading Comprehension questions was based on Health Hazards due to pollution. New Pattern Filler Questions were asked. So we have already posted the important questions and topics which are essential for the IBPS Clerk Preliminary Examination 2017, you can check the same and download that too. Please check the below link to download the important materials for the IBPS Clerk Prelims Exam 2017. Aspirants this is the right time to attend the MOCK Tests because the last week before the exam is vital and the mock tests will give you an edge over the others and it will provide you confidence to attend the IBPS Clerk Prelims Exam. We have provided FREE MOCK TESTS for the aspirants for practice and you can attend the same from the post which is mentioned here. If you still thinking of fixing a strategy to apply in the exam, please check this one and get an idea about the easiest section and choose the best section to attend in the exam. You can check that from the one that is give below. Check the topics that are easier to score and what are topics that has to be given preference in the IBPS Clerk Preliminary Examination 2017. You can check the video on the IBPS Clerk Preliminary Examination 2017 Strategy to clear the exam in the youtube video here. You can also check the detailed statewise vacancy of all the states for the IBPS Clerk 2017 vacancies from listed link given below. Alternately you can also check the official notification of the IBPS CLERK 2017 from the given links.